Welcome to the seventh visit by the independent transport videos cameras to the annual Liverpool Buses Running Day organised by the Merseyside Transport Trust. On this visit we go ‘on the road’ to see the vehicles in action in various parts of the city reliving the days when green buses were the norm running on the streets of Liverpool. For good measure we have filmed a few of the current buses plying the streets for comparison – but only a few – centre stage goes to the superbly preserved and turned out buses which are the subject of our programme! The filming starts at the MTT depot in the early morning sunshine of Sunday 8th September 2013. The buses are being prepared for service and we see them leaving the depot for a busy day ahead. The next sequence is ‘on the road’. Our cameras, with the help of photographer, Mark Youdan, visit many parts of the system to see the buses in action, from the docks in Bootle, city centre, Toxteth, as well as the leafy lanes to name but a few, showing what a diverse area buses in Liverpool serve. Ending up at the Pier Head we board, beautifully restored AEC Regent III, A36 (NKD 536) for a ride to Liverpool South Parkway along route 77A. Enjoy the sights and sounds as we make our way through the city to this busy interchange. A number of the movements are recorded here before we board recently restored Alexander bodied Dodge S56, 7685 (D685 SEM) on service 188, the Garston Circular. A very interesting comparison from A36! Back at Liverpool South Parkway more of the action is recorded including former Ribble vehicles to make the scene complete. We then take you back ‘on the road’ with more action shots in south Liverpool. As a bonus we take a brief ride on visiting former Halton Transport Leyland National 2, 33 (C49 OCM) just recently restored to it’s original livery, Halton Transport being no stranger to Liverpool. Our final ride of the day starts at Penny Lane as we board Leyland Atlantean L501 (501 KD) for a journey on service 99 to Lower Lane. 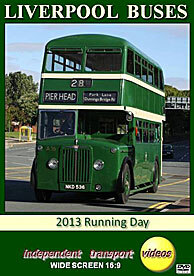 Superb sounds come from it’s Leyland engine as we enjoy a spirited journey through the streets of north Liverpool. The programme closes back where the day started, at Burscough depot, where we see the vehicles arriving and being put away. Yet again, a brilliant day. We would like to extend our thanks to everyone that have been involved in organising this excellent Running Day, and as always making us feel most welcome.